CLAYMONT, Del. (CNS) — Archmere Academy in Delaware has an expansive campus, but at its heart, the size of the student body at the private Catholic school fosters close bonds between members of the community. And last fall, Archmere principal John Jordan found out his former schoolmate needed a kidney transplant. Hare’s mother had called headmaster Michael Marinelli to have her son listed among the school’s prayer intentions. With his longtime friend on the donor list for the second time in his life, Jordan decided he would offer his own organ. A few factors helped him make the decision. Jordan was with Anthony’s parents, Melanie and Robert, when he died. 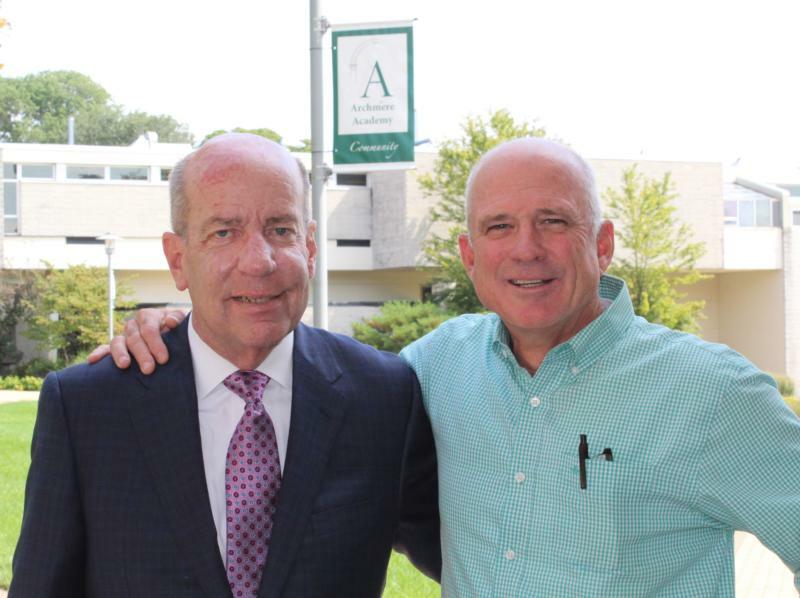 Jordan, who graduated in 1980, and Hare were connected through athletics at Archmere, one as an athlete, the other as a team manager. After college, they both migrated back to the Claymont campus. Jordan, 56, has spent most of his professional career at the school as a teacher, administrator and coach. Hare spent several years as a boys basketball assistant coach, and he would see Jordan nearly every day during the season. Hare, who turns 57 in November, also has spent time on Archmere’s board of directors and has been involved with the alumni association. He was on the board when Jordan was named principal. He was diagnosed with end-stage renal failure in 1992, when he was just 31. He spent more than seven years on dialysis before receiving his first kidney transplant in 2001. He returned to the transplant list for five years and remained on it for five years when Jordan offered one of his. His medical team at Jefferson Hospital in Philadelphia knew he was headed for dialysis again, so they were proactive in getting him on the list. They also encouraged Hare to seek a living donor. “Frankly, I don’t know how to do that. I don’t know if anyone does,” said Hare, a member of St. Elizabeth Parish in Wilmington. Hare nearly had a new kidney last November, before he heard from Jordan, but that did not come to pass. Jordan called him about two weeks later and made his offer, catching Hare off-guard. The pair met at a local coffee shop to discuss it further. They happen to have the same blood type, which is the first hurdle. Hare, an executive at a Delaware real estate development and management corporation, was overwhelmed. Jordan was cleared for the procedure in March, Hare in May. The surgeries were scheduled for June 5, two days after Archmere’s graduation. Jordan’s daughter was a member of the senior class. Melanie Penna knew, and she and her husband visited the men after the procedures. “It was a powerful moment as we took measure of the role that Anthony played in creating the miracle between them,” she said. Jordan was back at the school for half-days the week after his surgery. Hare needed another operation to stop some internal bleeding, but he is doing well. Anthony Penna, meanwhile, lives on through his donations. Three local people were a match, his mother said. A 50-year-old man received his liver. His kidneys were donated, one to a 40-year-old man, the other to a 20-year-old woman. A New Jersey woman in her 20s received one cornea, and an infant boy in Pennsylvania received the other. In addition, Melanie Penna said, her son’s skin, bones and tissues are in 68 transplant centers throughout the United States, ready to help someone else. Lang is the staff writer at The Dialog, the newspaper of the Diocese of Wilmington.